Federal Reserve monetary policy focuses on maintaining a neutral federal funds rate at 2.25% to 2.50% through 2019, which has been my Fed call. However, I disagree with Fed Chair Jerome Powell when he says that unwinding the Federal Reserve balance sheet is not tightening monetary policy. The balance sheet was increased to $4.5 trillion on a series of quantitative easingmoves that followed the 2007 to 2008 Great Credit Crunch. Removing this stimulus by unwinding the balance sheet has been called quantitative tightening, as reserves are removed from the banking system. This is Fed tightening. Each week, the Federal Reserve takes a snapshot of its balance sheet on Wednesday. On March 20, the balance sheet was marked at $3.962 trillion, down $9 billion from the reading on March 13. This is a Fed tightening move! Last week, the Federal Reserve put a time stamp on the unwinding, saying that it will stop at the end of September 2019. In my opinion, this is an unwind-pause, and unwinding will resume after the presidential election in 2020. Federal Reserve Chairman Jerome Powell wants the balance sheet reduced to $3.5 trillion, and the schedule through September will not meet this goal. The new unwinding schedule calls for a drain of $50 billion in March and April, then down to $35 billion over the next five months through September. This would total an unwinding of $275 billion. 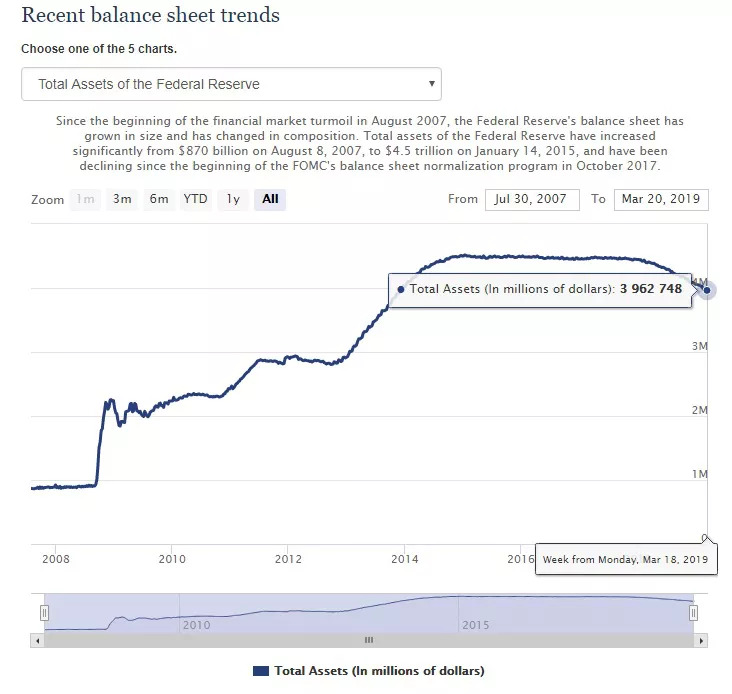 With the balance sheet now at $3.962 trillion, the balance sheet will need to be reduced by another $196 billion, which will require quantitative tightening to resume after the presidential election. 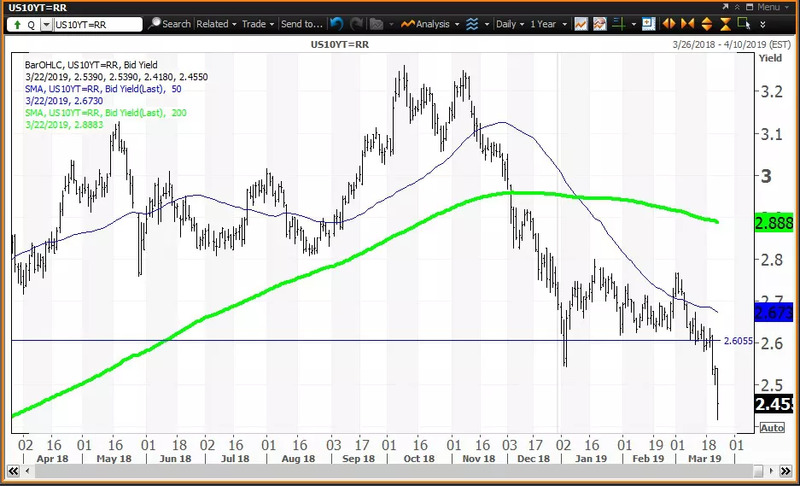 The daily chart for the yield on the U.S. Treasury Note shows that this yield has been under a “death cross” that favored lower yields since Jan. 11, when the 50-day simple moving average fell below the 200-day simple moving average to show that lower yields would follow. This yield was 2.70% that day and declined to a 2019 low yield of 2.42% on March 22. This yield has been below its semiannual pivot at 2.605% since March 20, when the Federal Open Market Committee (FOMC) announced a more dovish view on monetary policy. The yield closed last week at 2.44%, with my pivot for this week at 2.47%. Lower yields are a clear sign that economic weakness in Europe is helping a “flight to safety” into U.S. Treasuries. 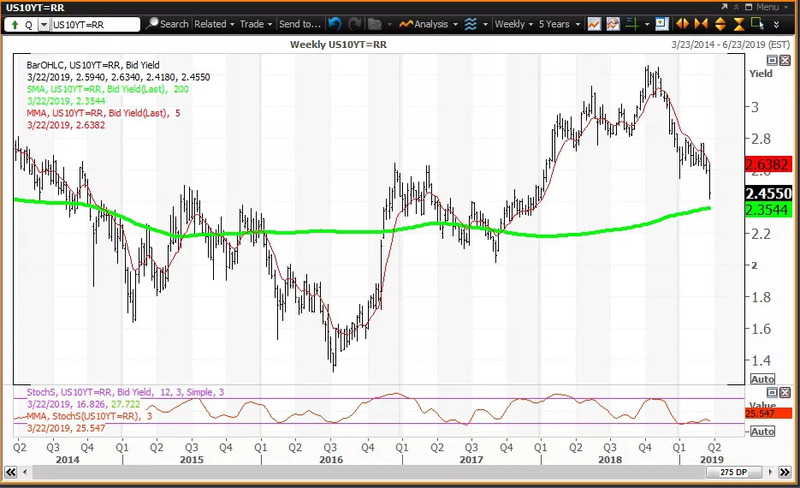 The weekly chart for the yield on the 10-Year U.S. Treasury Note yield shows that the decline in yields began from a high yield of 3.26% set during the week Oct. 12 as the stock market peaked. This week sets the lowest yield from this high at 2.42%, which is approaching the 200-week simple moving average, or “reversion to the mean,” at 2.36%. The decline in yield has the note below quarterly and semiannual pivots at 2.771% and 2.605%, respectively. The SPDR S&P 500 ETF (SPY) is 19.4% above its Dec. 26 low of $233.76 and is 5% below its all-time intraday high of $293.94 on Sept. 21. The ETF saw a “key reversal” day on Dec. 26, as the close of $246.18 that day was above the Dec. 24 high of $240.83. Investors should buy SPY on weakness to my semiannual value level at $266.14 and reduce holdings on strength to my annual risky level at $285.86. The ETF is below my monthly pivot at $281.13. 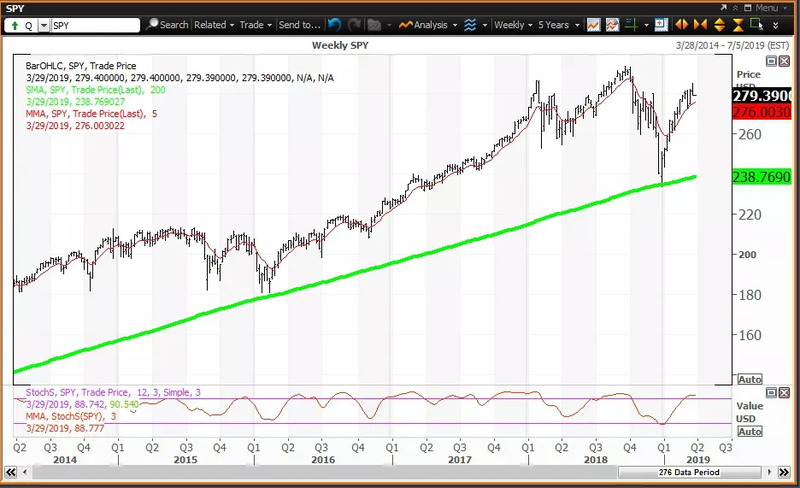 The weekly chart for SPY is positive but overbought, with the ETF above its five-week modified moving average at $275.16. 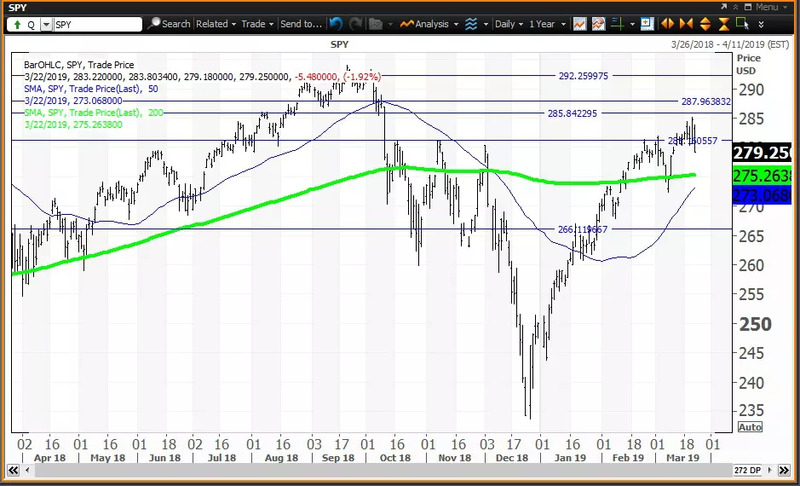 SPY is above its 200-week simple moving average, or “reversion to the mean,” at $238.43 after this average held at $234.71 during the week of Dec. 28. The 12 x 3 x 3 weekly slow stochastic readingrose to 88.80 last week, up from 88.51 on March 15 and moving further above the overbought threshold of 80.00. SPY may be a week away from becoming an “inflating parabolic bubble” with a reading above 90.00.